I wake up, put my contacts in, check eBay and emails, and get out of bed. If I need to work early that day I’m out of the house in 30 minutes, after brushing my teeth washing my face and putting sunscreen on. If I’m working from home, I’ll probably dry brush my body for a few minutes, water the plants, make a green juice, have some coffee, and start working. When I was younger, I thought the Childlike Empress from Neverending Story was the most beautiful thing I had have ever seen. She had a jeweled headpiece, and I emulated it often, making them for myself for fun. When it came time for my wedding, I ended up wearing a pearl wreath a friend had given me a long time ago, with my dad adding some fresh white roses to it. I think because I was looking at a lot of headpieces and veils for inspiration before the wedding, they were still fresh in my mind. So when I got back to New York, I began making custom pieces. My friends inspired me to make more as well as helped me create a lookbook, and from that, a showroom picked me up. I interned at Lanvin in Paris between my 3rd and 4th year in college. It was the first time I had a clear vision on what I wanted my life to be: living in Paris and being surrounded by the most beautiful fabrics. When I graduated college, my plan was to head back there, but I was invited to intern at DVF under Elisa Palomino in New York. After the internship, I found a few jobs in the American fashion industry. Being employed as a "Fashion Designer" was great, but something was missing. I wanted to make clothing that was telling a story, instead I was working in places that were more "inspired by" than "inspiring." Aesthetically, I’m all over the place. I enjoy wearing and collecting clothes that have history. Lately I’ve been buying a lot of Gucci and Prada from the mid 90’s, which was more or less the time I started to get into fashion. I wear a lot of embroidered pieces. I love the richness and energy that hand embroidery adds to clothing. I do 99% of my shopping online. This includes clothing, makeup, groceries and basically everything I need. I actually think I got so used to shopping online. It's almost unbearable being at a store and having sales people pushing products on me. I just love the comfort that comes with it. I love eBay for just about everything, The Outnet for great prices on quality lingerie, Amazon for beauty products, and Zara because their app is the best. I’m very good about using Sunday Riley Start Over Active Eye Cream and Sunday Riley Bionic Anti-Aging Cream on a daily basis. I love Sunday Riley Luna Sleeping Night Oil, Embryolisse Lait-crème Concentrate, and Josie Maran Argan Daily Moisturizer SPF 47. I wash my face day and night, and three nights a week I’ll use Retinol at night. If you are a recovering Sephora addict like me, you realize continuously trying new products as they come to market is kinda useless. Either they are the same with new packaging, or have a new technology that can’t really compete with Retinol. For me, I feel you don’t really need a fancy $60 moisturizer because coconut oil is amazing, and essential oils are just as good and usually smell better. I have an oil blend I make myself and carry in my bag, so I moisturize a few times a day, I’ll do a random mask once a week while watching Real Housewives of Beverly Hills. 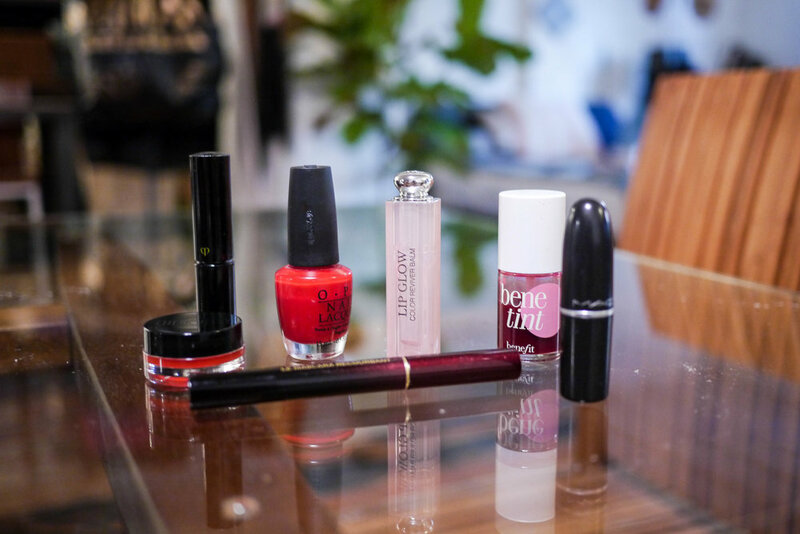 I recommend Dior Addict Lip Glow Color Reviving Lip Balm, Kevyn Aucoin The Curling Mascara, Opi Nail Lacquer, MAC Matte Lipstick, and Benetint Cheek & Lip Stain. For years, my hair took up a lot of my time. If you have curly hair, you’ll understand what I am talking about. I was always trying new products, and scheduling days to wash it (it takes about eight hours to dry). My hair is super temperamental, so I would never know what it would look like in the morning, or what it would be like in an hour for that matter. I use One N’ Only Argan oil as a conditioner in the shower, and also as a leave-in conditioner post shower. After, I’ll put on some DevaCurl gel in and braid my hair or pin the front (my curls get extra tiny if I don’t). Then I just let it air dry for a few hours. I recently got it to settle down and found a system that seems to work. 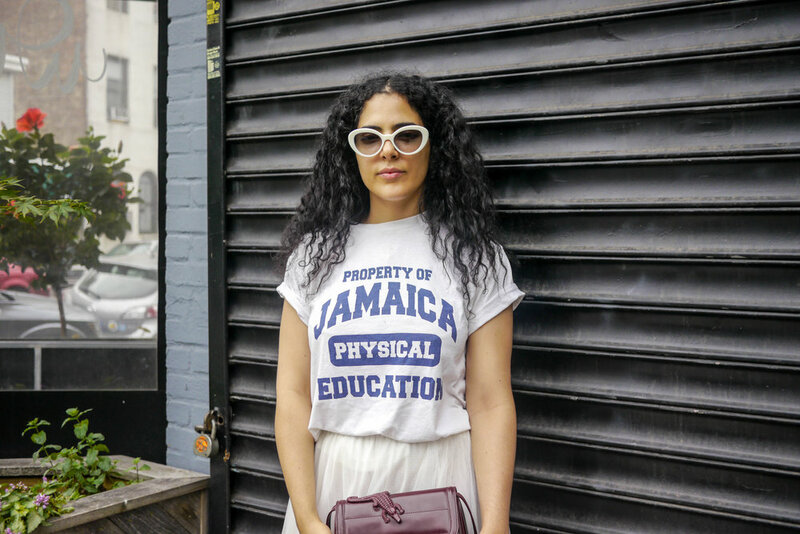 I follow the DevaCurl routine, which is not using shampoo, combing through it with my fingers and using a cotton t-shirt to dry. Kinfolk on Wythe, especially the Strictly Lovers and Sade nights. Z Relax on Union for great massages & Christine Chin for effective facials. Cafe Mogador for when I miss Israel and La Cerveceria for amazing tacos.